But they were not such big fans of the floating cages to grow the shellfish that may land in Steamboat Creek. “I just feel like our waters are our waters to enjoy, not for one person to profit off of,” said Pamela Comport, who lives on nearby Russell Creek. A two-person team has applied to locate what eventually could be as many as 700 cages in the creek along the island’s north end. Aubrey Sanders and Michael Kalista, residents of the Charleston region who previously have worked on a shellfish farm, say they’re committed to being good stewards of the environment and growing a product that Edisto can take pride in. The duo have scoured the state’s waters for places to locate, and “Steamboat Creek is certainly the most accommodating,” Kalista said. Trying to grow there requires undergoing a regulatory review by three agencies that could stretch as long as 18 months. 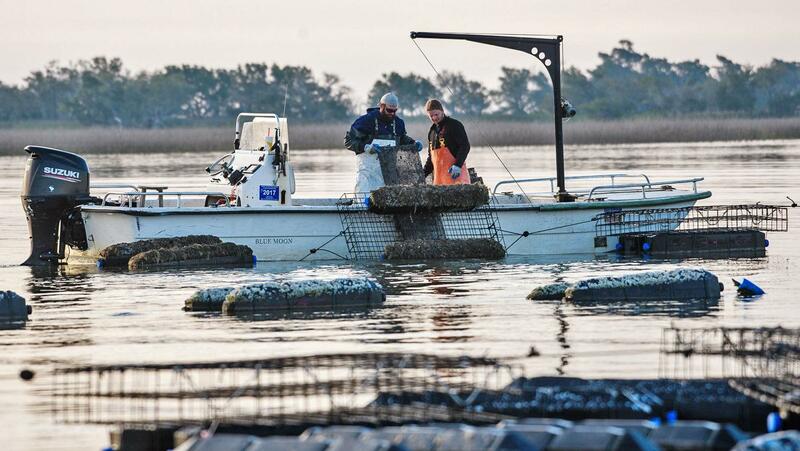 Tuesday’s hearing was a preliminary stop on that road, and many fellow oyster growers spoke in an attempt to clarify their still-fledgling industry. Only five cage growers have been permitted so far by the S.C. Department of Health and Environmental Control. One local chef, Mike Geib of 167 Raw, argued in favor of the farm, saying the business should be allowed the opportunity to compete against farms in the Northeast that flood the market with shellfish at dirt-cheap prices. Several locals, however, expressed concerns over the aesthetics of the floating cages. They also worried that boaters coming around the bend could collide with the equipment at the mouth of Steamboat Creek, which empties into the North Edisto River. Comport said boaters often moor near the site where the cages might be placed, making the channel narrower than it appears on maps.